Many house hunters do: They describe stepping inside a house and instantly feeling like it’s “home.” But was it the price, the amenities, or the location that attracted them? 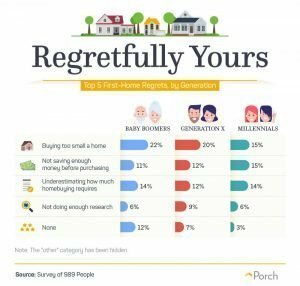 Home improvement website Porch.com surveyed nearly 1,000 consumers about their first home purchase to find some of the top factors that influenced their home buying decisions. Aesthetic appeal, affordability, commute time, and neighborhood character were the top draws, according to the survey. Sixty-seven percent of baby boomers and 61 percent of Gen Xers say affordability was the most important factor when searching for their first home. 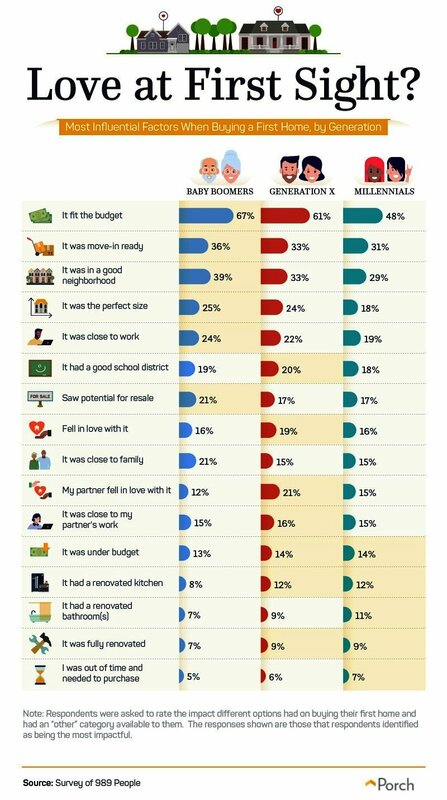 Millennial’s also placed a high priority on finding a home within their budget, as well as renovated bathrooms. Whether the home was move-in ready also was a powerful influencer, respondents say. “We know home renovations can get pricey, and one thing that appeals to potential first-time home buyers is finding a home where the kitchen and bathrooms are fresh and up to date,” according to Porch.com’s study.